Originally published in the ISS International Magazine (Oct 2013). The international self-storage industry appears to be divided between more mature markets, such as Australia, Canada and the United Kingdom, and very early markets, such as Latin America, the Middle East Russia and parts of Southeast Asia. Growth or, in many cases, the lack thereof, is often a theme of commentary on the mature markets, characterized by descriptions like “holding steady,” “quiet,” “flat” and “leveling out,” with operators looking inward to optimize profitability. The earlier-stage markets are also characterized by expansion: however, growing pains seem to prevail, including issues such as building codes, public awareness, taxes and the law. Still, there is a group of “in between” markets that are credible in size and still exhibiting double-digit annual growth rates. They are gradually moving beyond those early growing pains. Japan is one of those markets. The sign atop this Quraz facility in Osaka, Japan, is 4 meters tall, targeting the 20.000 households in a 1-kilometer radius and passersby driving on the adjacent raised highway. 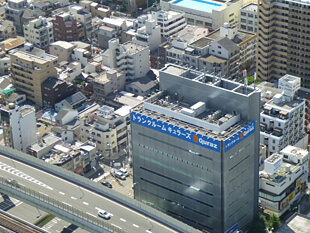 At JPY 24.3 billion in 2012, Japan is the fourth largest self-storage market outside the United States, following Canada. Australia and the United Kingdom. Japan is the fastest growing of these markets, which stands to reason considering penetration (measured as number of storage units per household) is the least developed - 3 percent compared to the other three markets at 1 percent to 4 percent. 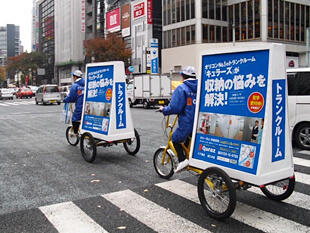 Quraz uses a mobile –marketing strategy that includes advertising affixed to bicycles riding through town. From 2008 to 2012, the Japanese market grew an average of 10 percent, as measured by gross potential revenue (GPR). GPR is defined as industry revenue, accumulated location by location, at published, undiscounted asking rates, at 100 percent occupancy. As an additional reference for market trajectory, the revenue growth tallied by Quraz, Japan’s largest operator of indoor self-storage facilities, averaged 15 percent from 2010 to 2012. Demand and growth in 2013 is also noteworthy. As the business has grown in size, year-over-year growth has actually accelerated. This is partly attributable to healthy and improving natural demand, produced by ongoing improvements in consumer awareness and improvements in the Japanese economy as a whole. The Japanese market is beginning to exhibit credible, absolute size similar to more mature markets, while still rapidly growing like younger markets. 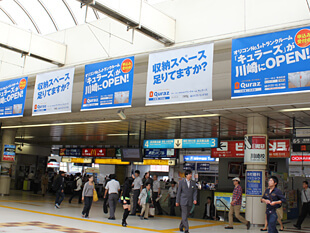 Advertising banners hang in Kawasaki Station, a railway station in Kawasaki, Japan, used by more than 185.000 passengers per day. Many of the growing pains experienced by less mature self-storage markets are due to ambiguity and uncertainty in property, tax and consumer law. Property rights and the rule of law in Japan, however, are transparent and enforceable, which should come as no surprise, since it’s the third largest economy in the world. These laws will continue to benefit self-storage development, gradually separating it from many other markets, primarily in its ability to attract institution-grade capital. As a case in point. Evergreen Real Estate Partners LLC secured JPY 20 billion in non-recourse, long term debt financing to complete its purchase of Quraz in September. The loan, provided by Prudential Mortgage Asset Holdings 1 Japan Investment Business Limited Partnership, part of the Prudential Financial Inc. Group, includes terms typical for self-storage asset or platform purchases in more mature markets. Though Prudential has had previous, positive experiences with self-storage assets in other parts of the world, this is the first such self-storage financing by any creditor in Japan. This financing is a major breakthrough for the Japanese industry, as it lays a path for other overseas and domestic lenders to follow. It was enabled in part by the clarity and enforceability of Japan’s property rights and rule of law, which is arguably a meaningful difference between this country and other less mature sell-storage markets. Last year Quraz was particularly bluish about the potential of the Japanese self-storage market. Now were even more confident about its potential. Our belief is driven by demonstrated actual and ongoing demand growth combined with gradual improvements in the credibility of self-storage as an asset class. The Japanese market has a long runway of outsized growth ahead. It’s showing signs of attracting institutional attention that could eventually accelerate that growth as more sources of investment capital take notice. 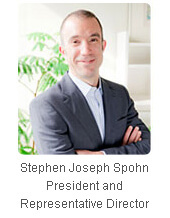 Stephen Spohn is the president of Quraz, Japan’s largest owner and operator of indoor self-storage facilities. Spohn has been living and working in Tokyo for nearly five years.